After the Giants moved from New York to San Francisco in 1958, it took them 53 years to win their first World Series in 2010. Incredible. Their next title came in 2012. Miraculous. Then, in 2014, they became world champions again. Magical. 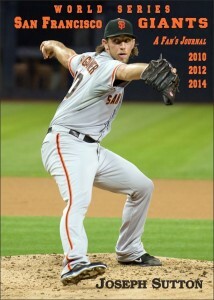 Drawn from his personal journal, Joseph Sutton has combined all three of the Giants’ World Series seasons into this one book. His unique observations will bring back a flood of memories for Giants fans, both young and old, on how the Giants, underdogs each year, reached the pinnacle of the baseball world three times in five years. What makes this book truly distinct is that it’s interwoven with the story of how baseball has influenced Sutton’s relationship with his son Ray, from the time Ray was a Little Leaguer through high school. It shows how the game of baseball, ever since its very beginnings, has cemented relationships between fathers and sons, and some daughters, too. The final score was 3-2 in what turned out to be one of the most exciting, riveting seventh games of any World Series ever played. Madison Bumgarner will go down in history as one of the greatest World Series pitchers of all time. He won two previous games in the Series with only one run scored on him, and then after only two days’ rest, he entered the game in the fifth inning to relieve Jeremy Affeldt, who had relieved Tim Hudson in the second inning. The score was tied 2-2 in the fifth when MadBum entered, and for the next five innings, he pitched a splendid, extraordinary, fantastic two-hitter without allowing a run to score. With Kansas City trailing the Giants 3-2 in the ninth with two outs, the Royals’ Alex Gordon slapped a sinking liner to left-center, giving hope to the K.C. fans and dread to the San Francisco fans. The ball was hit in front of center fielder Gregor Blanco, who had a notion of catching it on the fly but then got caught in no-man’s land. The ball skipped by him and rolled to the wall. Juan Perez, in left field, made a mad dash after the ball, but he bobbled it and had to chase another 12 feet for it, picked it up and threw to the cutoff man, Brandon Crawford. Should Gordon have tried to go home to tie the score, or should he have stayed on third like he did? That’s probably the big question Kansas City fans will be debating to their dying day. It seems like Gordon, had he gone home, would have been thrown out easily by Crawford, who possesses a strong, accurate arm. And so Gordon stood on third with two outs as the big, powerful Salvador Perez came to the plate. Who would be the hero, MadBum or Perez? Who’s side would the baseball gods favor? Perez was the only man to score against MadBum in the Series, hitting a home run off him in Game 1. The goat of the game would surely be Blanco if the Royals had either tied the score or pulled out a victory. If that happened, Blanco would have been driven out of San Francisco never to be seen again. As it turned out, MadBum, after six grueling, tense pitches, won his duel with Perez, who popped-out to Pablo in foul ground. I will never forget what Pablo did after catching the ball. He fell backwards and sprawled his arms and legs in utter relief before jumping to his feet to join his teammates in the celebration. Ray was a giant force for us today in the championship game against the Cubs. He got three hits, stole home twice in the first inning (could this be a baseball first?) and he sparkled on defense. Reggie Jackson was known as Mr. October in his day. Well, I’ve bestowed the title of Mr. June on my son. He’s been a savior for us throughout the playoffs this month. We are now the champions of San Francisco!